I was in my classroom, and because second period is my conference time, I was all alone. But thanks to TV and all the Facebook status updates, I felt very much connected to my fellow Americans when President Barack Obama raised his right hand. 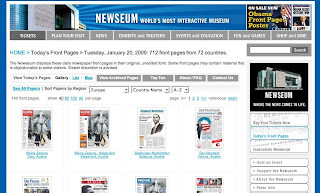 This regular feature of the Newseum's site gives students their own window to the world. They were able to see front pages from tons of papers in the United States and abroad. Fun stuff—and Wednesday's front pages should be even more interesting. 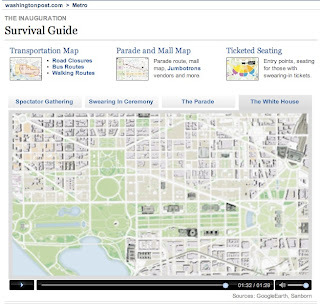 We especially enjoyed the Survival Guide with its Google Earth rendering of the Mall, Capitol, parade route and White House. It provided some geographic context, especially for those who have never been to D.C. This gimmick was a favorite! You can click on the presidents' pictures across the top to see word clouds for each president's inaugural address. 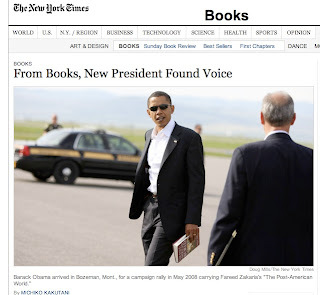 Also included are links to the NYT archives and the full text of each speech. I know I'll always remember this historic day; I'm hoping my students will, too!